Google tries to give users the most customized search results possible, and one of the first ways it does that is by determining the searcher’s intent and location. Is this person searching for something nearby or are they searching for information in general? The answer to that question will impact the type of results that Google supplies. For local-based searches, Google will supply search results based on the user’s location. For more generic queries, Google will give results on a national level. Google tries to deliver content for two different types of intent: local search and national search. In this article, we’ll discuss the differences between these types of searches and how Google decides which search layout to implement for each query. Local search occurs when the searcher aims to find something specific within a certain area. Google has flagged certain keywords and phrasing with this intent. 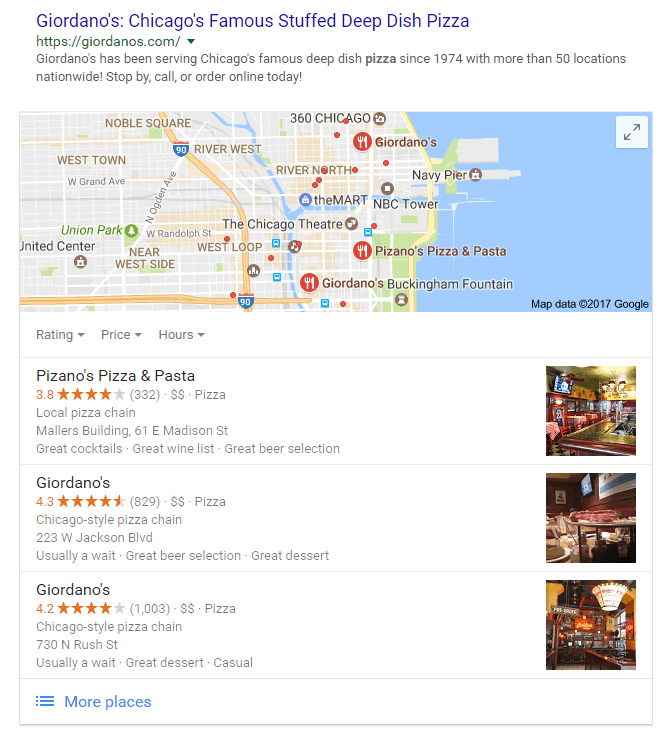 For example, the keyword “pizza” is flagged as a local keyword and will always show results based on the searcher’s location. People search for a lot of things not related to their location. For these types of queries, Google supplies national results, which are the same across the country no matter the location. The person in Tallahassee who searches “pizza dough recipe” is going to see the same basic set of results as the person from Chicago. Why does Google distinguish between local and national searches? Google wants to provide users with the most relevant results. If Google senses that someone is searching for something nearby, it will incorporate that person’s location in their search results. This is best for the user. Imagine the frustration of searching for “pizza” in Chicago only to see results from all across the nation. Users would have to dig through search results in order to find a pizza restaurant near them. Location isn’t the only thing that impacts Google Search. Google actually incorporates data from a lot of different sources in order to personalize its search results for each query. For instance, someone searching “apple pie” will find a preview of directions, nutrition facts, and recipe reviews directly on the search engine results page. Someone searching their bank may find contact information and general brand information embedded in the Knowledge Graph on the right side of the page. Google makes a lot of changes to its search results based on what it thinks the user may be looking for. In order to offer its users the best, most relevant results possible, Google will often factor in the user’s location. Google will supply different results for users in different regions if it determines a query has local intent. Local search results are triggered by certain keywords and when location modifiers are attached to a keyword. To learn more about local and national search, contact Performics today.